Andrew’s porch display greeted visitors over the Christmas period. 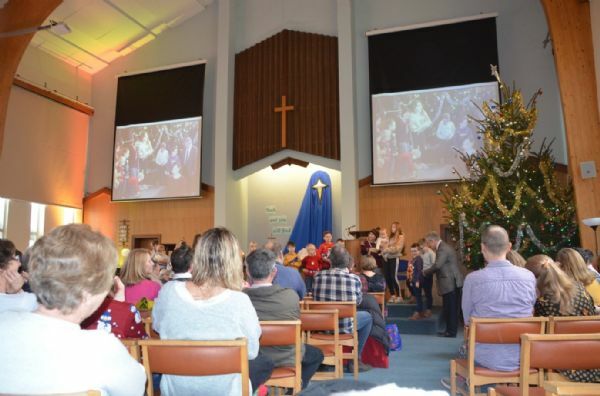 Saturday afternoon: Simply Carols attracted a good number of visitors who just wanted to sing over 20 carols and to munch mince pies. Keep a lookout for this successful event next year! Sunday morning: Ann preached for the fourth Sunday in Advent and did a different version of the bear hunt. Sunday evening: Dale Street’s new carol service was a mixture of the nine lessons and carols and selections of items from the Iona community. 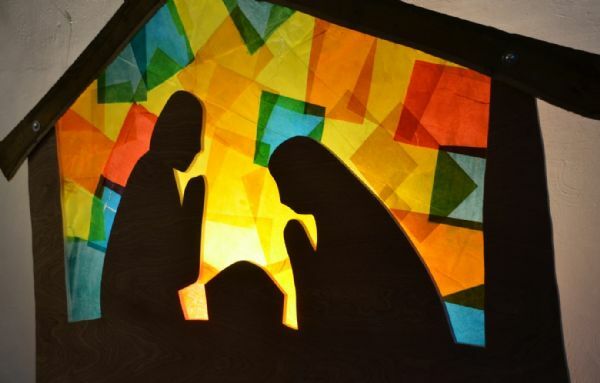 We dressed the cradle with strips of cloth and lit candles to represent God’s goodness. We also sang a new version of the first of the lessons instead of reading it..
Monday evening: Konect4 presented their own, original take on Christmas. 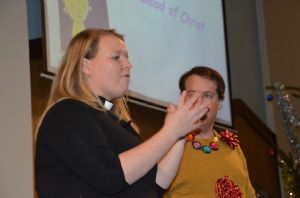 Monday night: Reverend Kim helped us to pause over some of the most revealing lines in the Christmas songs we sing out of habit - as Communon led us into Christmas Day. Christmas morning: Paul discovered a lot more children with presents than he had bargained for – and that children thankfully are not afraid these days to tell everyone at considerable length about them. A swathe of blue material provided colour in the area behind the table. So ended a hugely busy period in Dale Street’s life! Jemima and Michael took families on a very special journey to Bethlehem and back in their version of We’re going on a bear hunt with plenty of noises and actions. The oranges were bigger this year and very soft and sweet, and the tables were full of the usual bits and a great deal of food. The candles were real – perhaps a step forward from our risk-averse society, and of course there were no injuries! It was a good mixture of worship and activity, and no time was spent telling people what to do with their oranges. The results were truly artistic. 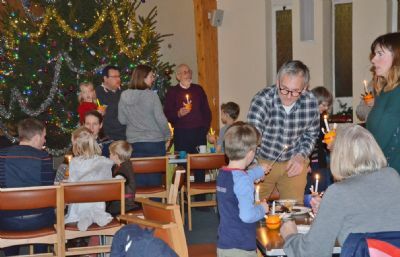 Christingle is a unique idea in the church’s year, a real event for families. Perhaps we need more like it. This was Sheila Koch’s last concert as musical director and consisted of her favourite – but not all of her favourite – Christmas pieces from Lauridson to Rutter, from Praetorius to Chilcott . Climax of the evening was Bob Chilcott’s setting of the Twelve days of Christmas with its variations on the five gold rings, with piano duet and percussion. The evening finished with the second encore, Lullay Lord Jesus, during which a series of pictures making an appeal for our charity was projected. More than 150 attended this event. Tributes were paid to Sheila for her 26 years as director. She handed the baton over to Paul Sudlow (whose setting of Hardy’s The oxen we performed) but promised that she would continue to sing with Divertimento. 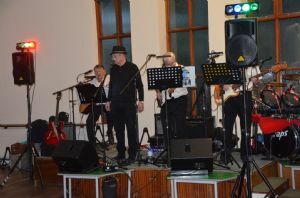 The event raised over £1500 for Action for Children. 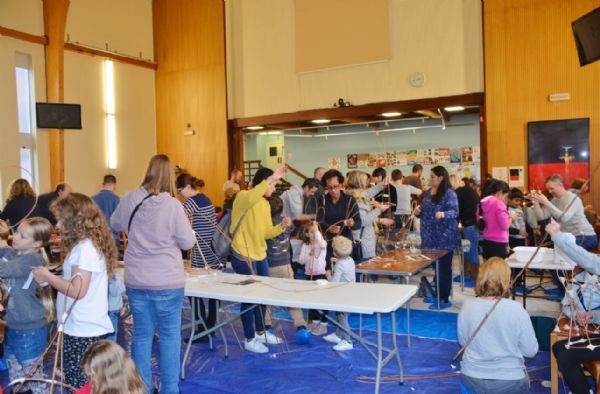 The church buzzed with families on Saturday afternoon as nearly 200 came to prepare lanterns for the town procession on the 2nd December. One half of the church was battened down and lantern-makers wore blue overshoes to keep the glue off the carpet. There were cutting areas, frame-making areas and glueing areas and on the other side long tables were laid out with activities and toys where people could meet and chat. There were lots of children, immaculately behaved and busy all afternoon. 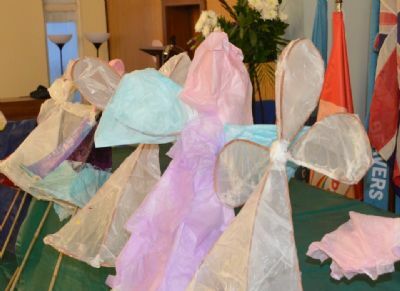 Gradually, lanterns of all shapes and colours emerged and were proudly carried to the stage to wait for them to dry – then home to await the parade starting in the Jephson Gardens on the 2nd. Some were left here to provide our own nativity as part of the parade. People arrived looking happy and left looking distinctly tired. This was a great afternoon for bringing the people into Dale Street, and Ian and Michael must be very encouraged that their hard work paid off. Here are some of the lanterns, made on firm wooden constructions. Small LED torches were demonstrated that could easily be held inside the framework. These would create a real festival of light as they shone in the darkness. 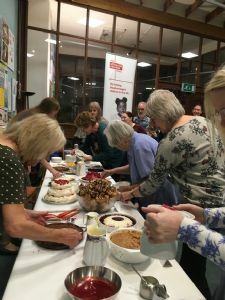 Truly Scrumptious would have been an alternative title for this latest event run by Action for Chidren’s support group at Dale St.
What an array of puddings – a feast for the eye as well as the appetite! 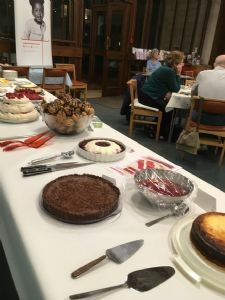 A long table at one end of the community room groaned with the selection of hot puddings, cold puddings, old favourites and something new. 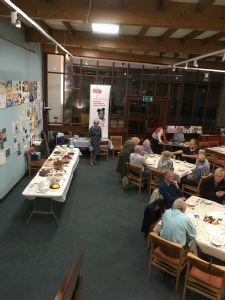 There was a table quiz which invited diners to test their pudding knowledge. Information and readings about puddings provided some space before further opportunities to try something else. At the end of the evening guests returned home replete and the funds of Action for Children were also increased. Thank you to all the bakers, makers and organisers. This was another noteworthy service, coming very shortly after the Church Anniversary. For one thing it was one of the first services taken by our new minister, Reverend Jeongsook Kim. 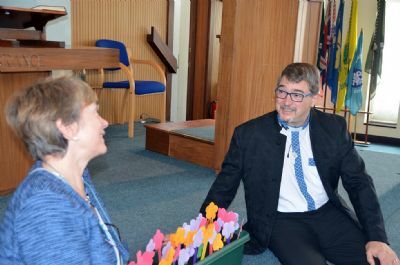 For another, we were joined by our new families and children’s missioner, Michael Sharman, whose new job promises us innovation and outreach. Finally, our circuit superintendent, Peter Powers, also conducted part of the service – so we had three for the price of one! The theme was not a hundred miles from the week before, although the compost was replaced by potatoes – which symbolically grow in the dark. For those of you browsing this page, here is a reminder that each month in the evening there is an innovative, modern service led by Tim and Cat with keyboard, percussion, lead and bass guitars. Expect two groups of three contemporary songs and what can be some very unusual concepts of preaching (on one occasion we were all given drums to group-play; on another it was a session of Pass the parcel). This event has now transferred to the stage in the church hall, which means that it is easy to set up. Comfy chairs are provided – and refreshments! A lot of work goes into each session, and it is deserving of more people. The group has been known to travel and in the summer may be found in the open. On this occasion, Konect4 was celebrating its birthday. 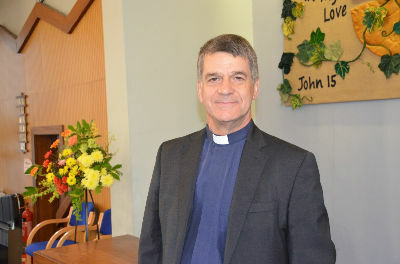 We asked Rev Steve (Steve Jakeman, our visiting preacher) what we would want for the service and he said, ‘A long container full of compost’. 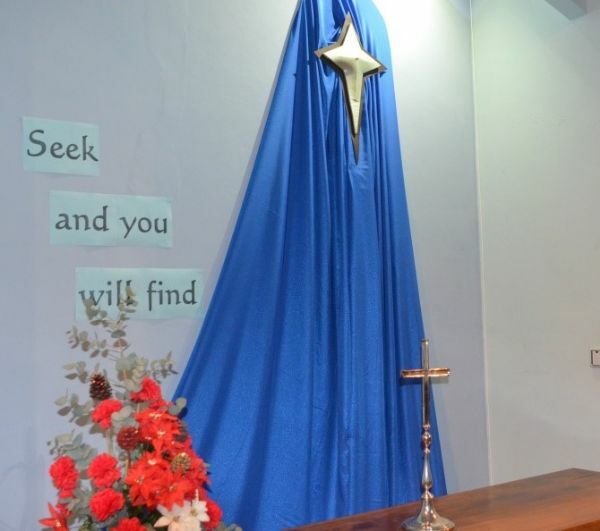 As you can see, it finished up planted with prayers, names and matters of concern and, colourful, it stayed in the entrance of the church for a few weeks afterwards. Steve’s theme was about seeds and harvest, and was the latest in a series of reminders that as members of the church we must all be prepared for mission. Steve’s visit was a return to Dale Street where many years ago he was a member of the youth fellowship and took part in many productions by the drama group at that time. Many years later after another similar vision, Steve decided to become a Methodist minister. In the service and during the afternoon when he officiated at a very well-attended christening, many of his friends from Leamington came to join us. A huge congregation from the whole of the circuit gathered to wish Andy Laird well on his retirement. The service was attended by the Mayor of Royal Leamington Spa. 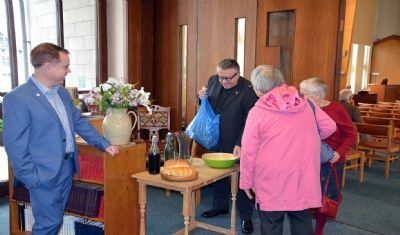 We thanked Andy ‘for all sermons and prayers written, songs and hymns chosen, liturgies crafted, connections with news and everyday life woven together’ and all the aspects of the busy life of a minister. John Harris preached from the front on the theme ‘Doing a new thing’ – for all of us and not just for Andy. There was a formal setting-down of the keys of all the churches for which Andy had responsibility, and also a setting down of his diary – a clean one, since everything is electronic these days. 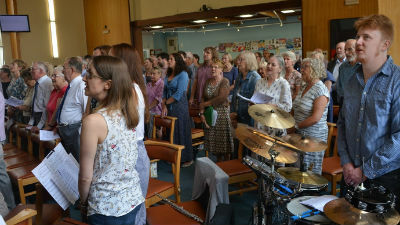 Before the service, a ten-strong worship band led the singing of a number of up-to-date songs, and there were two songs, Baptised with fire and Let us go forth in the peace of Christ, sung by our own group of singers. The service ended with an organ voluntary and a repeat of two of the opening songs by the band which then played with additional zest. As is the convention, Andy will not be seen in any of his churches for a year, after which we may expect an occasional return to the pulpit. We retired to a sumptuous tea and a good time was had by all. May the Lord be with you, Andy. The programme was, as might be expected, largely about rain. Ironically we had already had our forty days of brilliant sunshine and the weather was due to break on the 16th. It’s a myth of course, brought about by the good Bishop Swithin of Winchester who requested burial under the eaves so that rain might drip on his grave. 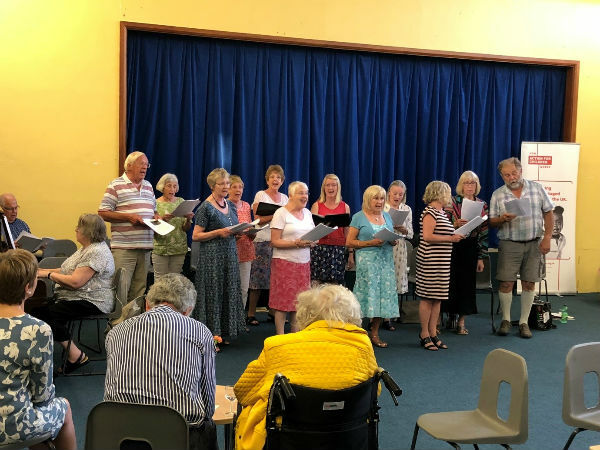 The performers were our own, and the programme consisted of fifty minutes of song and readings – followed by strawberries and cream and some delicious shortbread. Sing it St Swithin was the title song and we went on to cover holidays, Noah’s ark and the shipping forecast. BBC BC was an OT forecast of plagues of frogs, lice and boils, and an alternative shipping forecast included forties, fifties, sixties and, from somewhere, Leyland Daf and Ginger Rogers. Our resident members of the Harbury Folk Club sang the The Weatherman’s Song, and below, the picture immortalises a performance of The dog in the microwave. Frequent attempts to complete the tongue twister Whether the weather met with gales of laughter. It was certainly an unusual programme enjoyed by a rather small but appreciative audience (we were in competition with a rather exciting Wimbedon). This evening was in aid of Action for Children and was organised by Dale Street’s support group for the charity. These sounds were to the Heartbeat band, another successful Dale Street Action for Children event held at St Mark’s Hall, Leamington. Some seventy people were there, many to dance the evening away, and others to listen nostalgically to tunes they all remembered from a long time ago. No, it was actually pre-rock-and-roll, although one or two people had come thinking that it was just that. 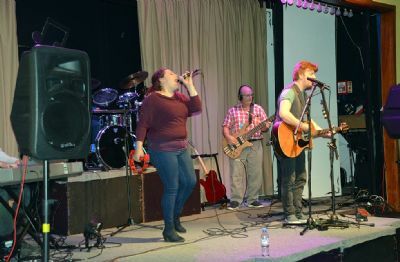 The band was a five piece, several guitars, percussion and some very good vocals, nicely harmonised. The supper was a plough-person’s, a little more sophisticated than in the sixties when the food was not as varied as it is nowadays. Who was it complained there was no pork pie? The pate was particularly good! The dancers-audience came from Dale Street, other churches, groups of friends and even an unattached few who had come just for this quite unusual evening. It was good for once to have a series of interconnected series of Sunday morning services. The plan was for four Easter people, Cleopas, Peter, Stephen, the women at the cross – and as an extra, David Greenwood told us how Thomas went to spread Christianity in India. 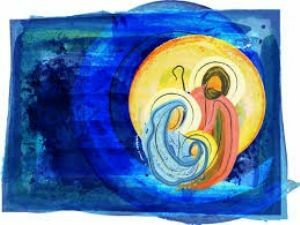 So often the events around Easter are so concentrated on our Saviour that we forget the unique personalities of those who were left, the real significance of the road to Emmaus, the exciting and important part played by the women disciples, and the changing emotions that they all encountered after Christ’s death. All these services were presented with real authority, and it was obvious how much work had gone into researching them. There was a unity of purpose and we were able to appreciate the whole story and not just bits of it. We remember Russell’s drawings and moments of interaction such as when Paul leapt up to make sure that Russell’s artwork did not fall over. The idea of having a theme song that we sang for each session was clever – and it worked. These services were enjoyable, lively and left us thinking. And there was a good deal for the children. What an achievement! Nearly 200 members of our own uniformed organisations were together on the stage for the finale of yet another packed-out show. The programme outlined the history of Daley Sketches (named after a long-dead newspaper) and the rationale – to ‘work in teams and perform in public’. This was a mix of singing and spoken sketches including the usual awful jokes, and everything was prepared in just six weeks. The Beavers presented 12 days of camping to the well-known Christmas song, with five toilet rolls and seven smelly socks, The running gag was aptly named ‘Wogglebox’ and featured some engaging local filming and a lot of terse comment. The Brownies worked their way through votes for women, though velcro caused some hilarity among the Victorian costumes – ‘what a rip-off!’ Talking of which, all the costumes were consistently good and very varied, perhaps at their most colourful for the squad’s ‘South Pacific’ item, complete with goggles. 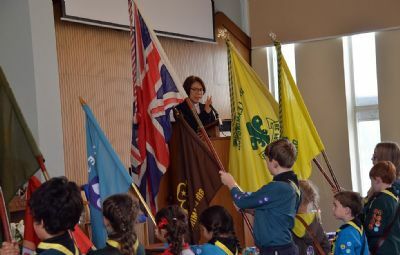 The ‘old leaders’ repeated their famous rendition of ‘If I were not a scouter’ from all those years ago. Forty years on it was perhaps a little more circumspect and unlike the original, no one was in danger of suffering lasting injury. Was it age or Health and Safety? At a special service on Sunday afternoon, Andy emphasised the theme of togetherness and there was much about developing and using talents. Andy also reminded all those present that they had voices and that they should use them if they suffered from bullies. 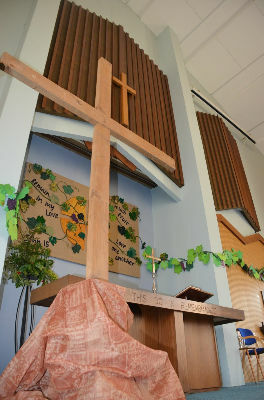 Following our tradition of recent years, an empty cross was installed in the church on the first Sunday of Lent. 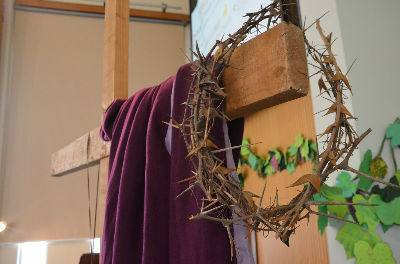 On the remaining Sundays during Lent, symbols relating to Christ’s passion were added to the cross. 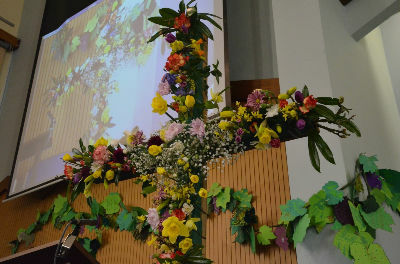 On Easter Sunday, the symbols were replaced by colourful flowers brought by members of our congregation. 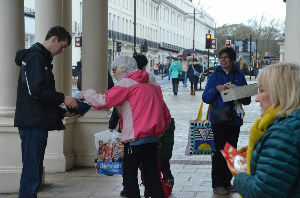 At 8 o’clock the buns were packaged, and by 10 the team was busy greeting shoppers and giving out 250 buns in 40 minutes. ‘I had a family of six’, boasted June and many congratulated us on a ‘marvellous idea’. Of course plenty of others thought it was yet another marketing trick and some simply didn’t like buns. One gentleman asked if we had a ‘ticket’ – yes we had, from the Town Hall and from Riverside – and we obeyed all the hygiene rules too. Most buns went into shopping bags, though some children scoffed theirs immediately. This was Dale Street’s project to further the Churches without Walls initiative. 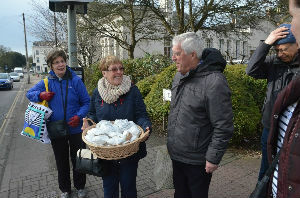 Next year the plan is to distribute 500 buns at the railway station. You may not know it. 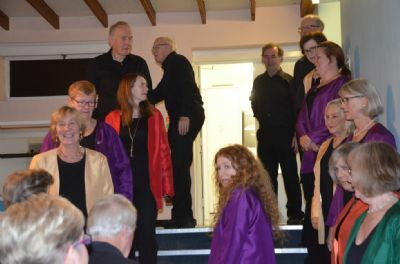 But Divertimento rehearse every Thursday at Dale Street and that they are distantly related to the church via the Circle Singers who themselves were originally connected with a youth club in the 1960’s. This concert was called Sacred and Secular and included a section of Scottish music. Howard Skempton, one of Britain’s leading composers, was in the audience to hear two of his compositions. Paul Sudlow accompanied his settings of The Lamb and The Tyger, both written for Divertimento. The concert was illustrated with pictures, notes and translations via Powerpoint, using the church projection equipment. 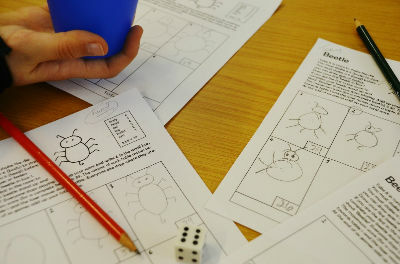 Throw a six, you have a body – a five, a head and so on, until you have the complete beetle and you yell ‘Beetle!’ Divide fifty avid Beetlers into tables of four and you have a cacophony of rattling dice and excited shouts. There’s no challenge – anyone can win or lose and it is strictly all ages. Your score is when you add up the value of your beetle’s body parts. Winners and losers move on to another table and you start all over again. We played six rounds to Nicky’s whistle at four o’clock on a snowy afternoon and the occasion was hugely improved by the arrival of fifty two portions of fish and chips. You’d think something as simple as this would be less than satisfying. No, the inventor of this little game deserved a medal for providing us with such an atmosphere of noise, speed and dexterity. Let’s do it again! 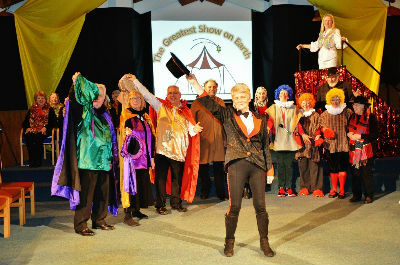 Three performances of the Christmas musical, The Greatest Show on Earth, by Michael Kirkup and Derek Hobbs chased away the January blues. The church was transformed into the circus big top and the March of the Gladiators announced the arrival of a ringmaster, trapeze artist, clowns and all the rest – the trapeze artist became the angel, the clowns the shepherds and Mary and Joseph were the cleaners who opened the show. Roger’s Herod was a mafia guy and his sidekick, Luigi, wore a black patch over his eye and who carried a knife. There was thunder and lightning, stars in the church ceiling, and a video of two scribes singing an annoying little song about the prophets. Our production was a miniature one, cleverly arranged by Jo. It was fast, energetic, and very tuneful, accompanied by keyboard, bass and percussion. In all, 300 in the audiences hissed the villain and guzzled the sweeties thrown at them by the clowns. It reminded us that Christmas was still with us for the rest of January, and this was a fitting celebration. 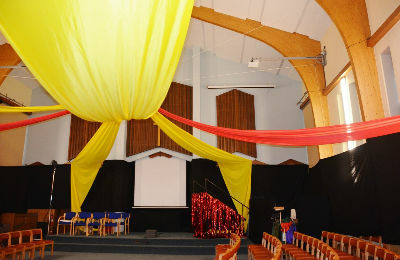 Next morning, the big top and the layout of the chairs remained for all age worship, which David Greenwood based on what Jesus told us about bullies, and the cast finally put the show to bed with a reprise of the opening chorus. Our wholly-committed cast thank all who helped them to make this a great success, especially to Andrew and Nigel who worked tirelessly on the set, pictured above, and the innovative lighting and sound. 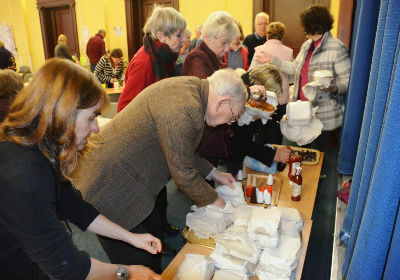 We are also grateful for support from other local churches - in particular, Whitnash Methodist Church.